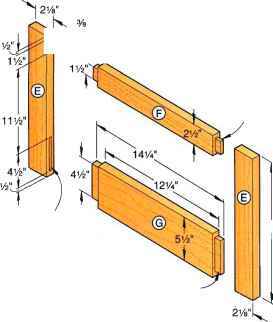 ICut the front and back frame members—rails (A and B), stiles (C), and mullions (D)—to the sizes listed in the Materials List. Note that the back frame does not have the two center mullions (D). 2 Cut the side frame members—stiles (E) and rails (F, G)—to size. 3 Lay out and cut the mortises and tenons in the frame members, where indicated on Drawings 1 and 2 above. 4 Glue and clamp the front frame together, checking for square, and adjusting if necessary. Repeat the procedure with the other frames. After the glue dries, scrape off the excess, and sand the joints smooth on both sides. 5 Fit your router with a rabbeting bit, and rout 'A" rabbets 'A" deep along the inside edges of all four frames, where shown on Drawing 3 on page 90. (We used a scrap of W oak plywood to check the depth.) Square the rounded corners with a chisel. The rabbets will later house the oak plywood panels. 6 Turn the frames over, and rout a lA" bead along the inside edges of all four frames, where shown on Drawing 3. 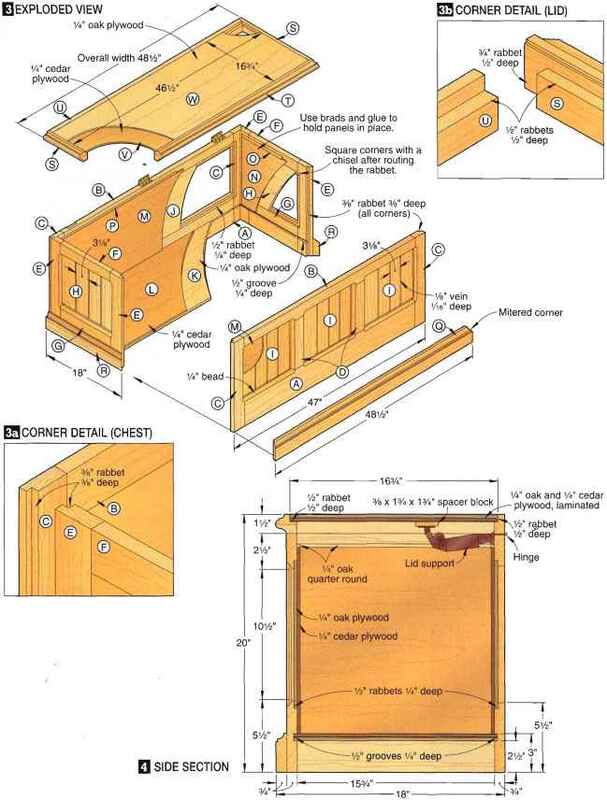 7 Install a dado blade in your tablesaw, and cut a W groove lA" deep 2'A" up from the bottom of each of the four frames for the chest bottom, where shown on Drawing 4, on page 90. 8Cut a 3A" rabbet 3/s" deep along each end of each frame, where shown on Drawing 3a. Use brads and glue to - hold panels in place. Square corners with a chisel after routing the rabbet. UGlue panels H, I, and J in the rabbeted openings in the framework. 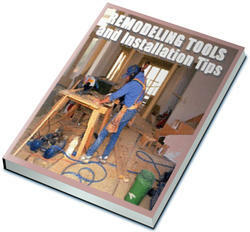 Remove any glue squeeze-out on the face of the panels with a damp rag immediately after clamping. 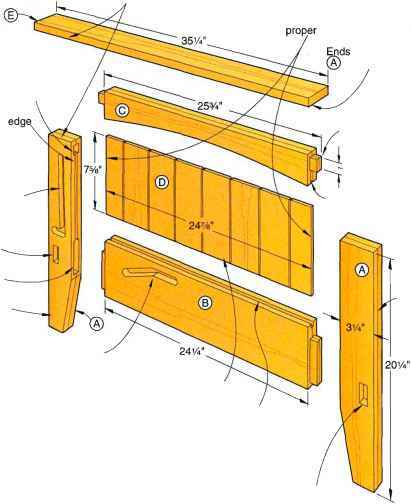 To fashion the bottom, cut the oak plywood (K) and cedar plywood (L) to size plus Vi" on all sides. Then, laminate the two plywood pieces with contact cement. Finally, trim the laminated panel to finished size (163/i6x4515/i6") with a tablesaw or with a circular saw and a straightedge. (We cut our laminated panel W shorter in length and width than the dadoed opening to allow for contraction of the framework.) Dry-clamp the chest framework, making sure that the bottom (K/ L) doesn't prevent the rabbeted corner joints from fitting snugly. Once the framework fits together correctly, glue and clamp it, checking for square and making sure that the top edges of the four frames are flush. M Scrape off the excess glue after it dries.Then, sand all surfaces smooth.